The "Bolt-Action Sniper Rifle" in Battle Royale is modeled after the [[Accuracy International Arctic Warfare]] series of sniper rifles, though in-game it holds only one round despite being depicted with a box magazine. The model is reused for the "Standard Scoped Sniper" in Save the World, and an unscoped version of the AW is the weapon model for the Epic and Legendary variants of the "Standard Sniper". The "Bolt-Action Sniper Rifle" in Battle Royale is modeled after the [[Accuracy International Arctic Warfare]] series of sniper rifles, though in-game it holds only one round despite being depicted with a box magazine; bizarrely, despite being explicitly referred to as a bolt-action, the in-game rifle has a straight-traveling charging handle that reciprocates and ejects a spent casing when the weapon is fired, making the "Bolt-Action Sniper Rifle" the world's first semi-automatic rifle with a one-round capacity. The model is reused for the "Standard Scoped Sniper" in Save the World, and an unscoped version of the AW is the weapon model for the Epic and Legendary variants of the "Standard Sniper". This article is still under construction. It may contain factual errors. See Talk:Fortnite for current discussions. Content is subject to change. 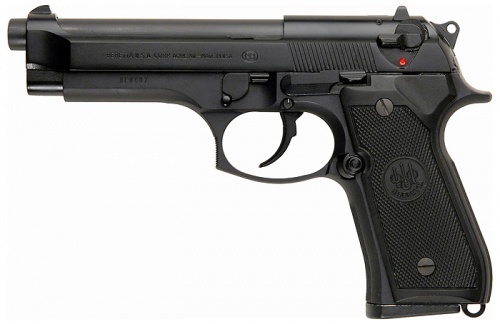 2.2 Beretta 93R “Auto 9"
Fortnite is a 2017 video game developed by Epic Games. The game has been released as different software packages featuring different game modes that otherwise share the same general gameplay and game engine. 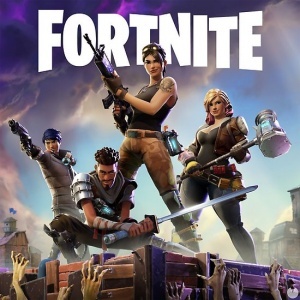 The game modes include Fortnite: Save the World, a cooperative shooter-survival game for up to four players to fight off zombie-like husks and defend objects with fortifications they can build, and Fortnite Battle Royale, a free-to-play battle royale game where up to 100 players fight in increasingly-smaller spaces to be the last person standing, very similar to Playerunknown's Battlegrounds. Both game modes were released in 2017 as early access titles; Save the World is available only for Microsoft Windows, macOS, PlayStation 4, and Xbox One, while Battle Royale has been released for those platforms, Nintendo Switch, and iOS devices with Android support expected in mid-2018. Players can use a variety of different firearms in Fortnite, each with their own stats, abilities, and advantages. Most of the weapons bear a strong resemblance to real-world firearms, although with some cartoonish and simplistic alterations. Some weapons are sort of "Frankenguns", that is, they bear characteristics of several distinct guns mixed together. Variants in the game come in Common, Uncommon, Rare, Epic, Legendary and Mythic variants, denoted by the colors gray, green, blue, purple, orange and gold, respectively, althrough Mythic is for the moment an exclusive rarity to Save The World avaliable only for heroes and lead survivors. Ammunition is often divided by gun types, but also may differ depending of game mode. In Battle Royale, all rifles use Medium Bullets as a balancing measure. In Save the World, Light Bullets are usually saved for pistol rounds and small, intermediate cartridge rifles up to 5.56x45mm NATO, Medium Bullets are reserved for most .30 and 7.62 rifles and machineguns, and larger pistol rounds, ranging from .45 ACP to .357 Magnum, and Heavy bullets are usually used for weapons that fire rounds from .338 Lapua up to .50 BMG, and pistol rounds from .44 Magnum up to .50 AE. Shells 'n Slugs are usually meant to be buckshot and birdshot, althrough some weapons use actual firework shells and slugs in place of the usual buckshot. The game entered Early Access release in July 25th, 2017 after some years on development, and is expected to make a full, Free-to-Play release in 2018. Currently, only the Battle Royale mode is free-to-play, with the PVE campaign Save The World unlocked upon a purchase of a Founder's Pack. This page will attempt to cover the weapon models used in the game since some of the in-game weapons share the same models and while others have different models depending on their rarity. 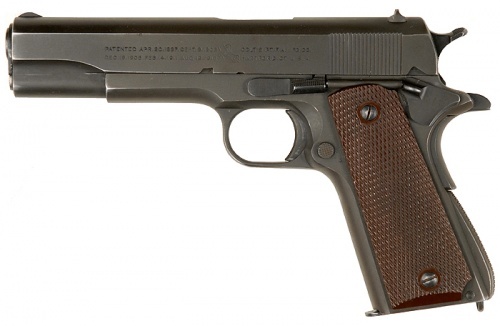 The weakest and most basic of the handguns, simply called "Pistol", bears resemblance to the M1911 and the Beretta 92 series, although its front and rear sights are largely exaggerated, and the in-game model appears to have no safety on the back of the grip. The slide lock also appears much shorter and farther forward on the gun's body, largely due to the gun's cartoonish nature. It is available in Common, Uncommon, and Rare versions. It uses Light Bullets, and offers weak to moderate damage. 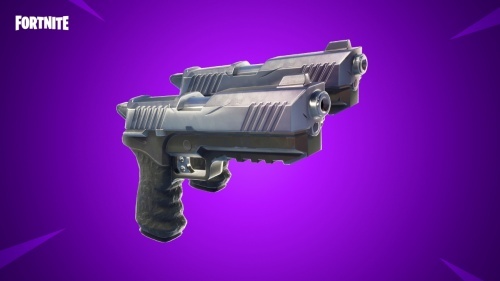 In Save the World, it is the main model for the "Semi-Auto Pistol" series. The series features different models for the Epic and Legendary versions, named "Vendetta" and "Jackal". Those versions have a nickel, etched finish and pearl engraved grips that feature a picture of a jackalope, hence the name. Concept art of the pistol in Fortnite. Note the 92FS-like ejection port. The model for the "Jackal" and "Vendetta" in Save The World. 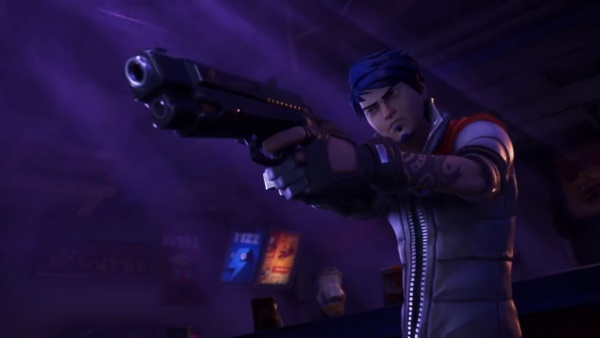 A weapon known as the "Vindertech Burst Pistol" (epic) and "Vindertech Burster" (Legendary), exclusive to Save the World, appears to be based on the Beretta 93R “Auto 9”. The weapon uses energy cells, having apparently been converted to fire bolts of energy, and has a 24 round magazine. It appeared during the Vindertech event, and is usually considered to be the best innate energy pistol in the game. It was avaliable again during the Birthday event. The model for the Vindertech Burst Pistol/Burster. 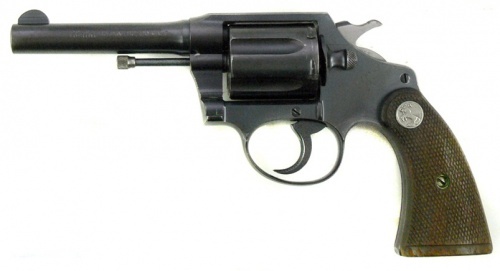 A Colt Police Positive-like revolver with custom engravings and a bronze finish appears as the "Revolver" in Battle Royale. It is available in Common, Uncommon and Rare variants, and uses Medium Bullets (it used Light Bullets prior to patch 2.5.0). In Save the World, it is the main model for the "Six Shooter" series. Depending on what tier the weapon is at, it can offer varying degrees of damage that is at least twice as much as the pistol, but at the cost of a sluggish fire rate and low reload speed. The Revolver model in Fortnite. It is arguably the most exaggerated and cartoonish gun in the game. 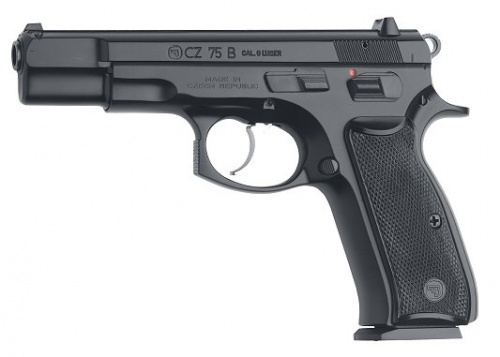 The "Quickfire Pistol" is shown in Save The World and is based on the CZ-75. Unlike most other pistols in the game, it has the hammer in the proper cocked position, althrough this is moot as it doesn't move when the weapon is fired. It does relatively low damage, but is balanced by it's high rate of fire cap of 480 RPM, allowing it to be used as a "spam" pistol that can fire as fast as most people can pull the trigger, being able to out-DPS certain assault rifles with characters like the Ranger. It has two variants in Epic and Legendary named "Haywire" and "Haywire Storm". 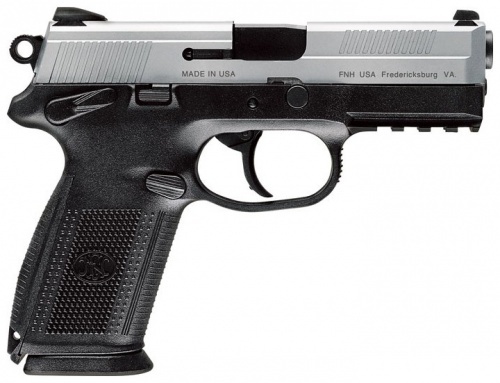 It features a large 20 round magazine and has good accuracy, even in the move. An engraving on the size discerns it as a "CX-65 Combat", hinting at it's origin. 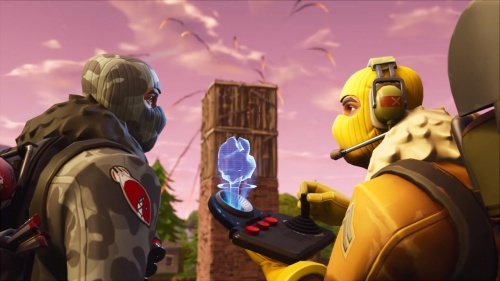 A.C. uses his Quickfire Pistol while fending off husks during the Fortnite Cinematic Trailer. 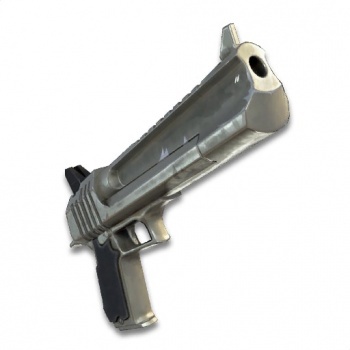 The Desert Eagle appears in Battle Royale as the "Hand Cannon", where it expectedly has the highest per-shot damage of all the handguns in that mode. The Hand Cannon can appear as Epic and Legendary versions and uses Heavy Bullets. 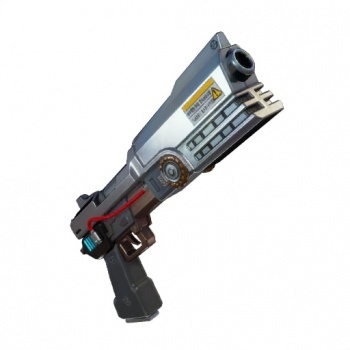 In Save the World, the "Semi-Auto Handcannons" use a similar, more battered model, and are appropriately named after various birds of prey. In the other hand, these Handcannons feature lower damage, almost twice the rate of fire, and an 8 round magazine. 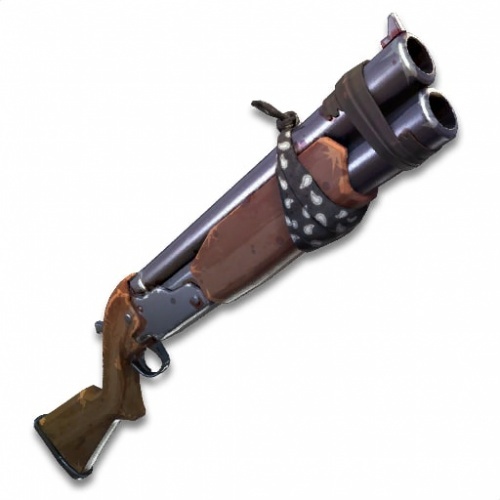 The Battle Royale model appears in STW as the "Bald Eagle", featuring much higher damage, implying the Semi-Auto Handcannons are chambered in .44 Magnum, while the Bald Eagle is chambered in .50 AE. Icons for the Hand Cannon in both its epic and legendary tiers. A still from a promotional cutscene gives us a good look at the Hand Cannon. The model for the "Semi-auto Handcannon" in Save The World. 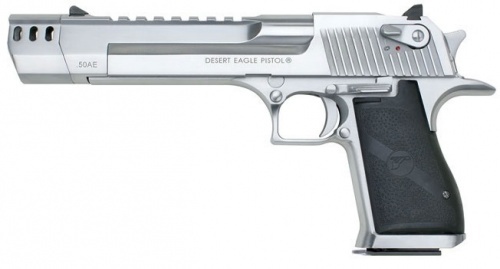 Unlike the Bald Eagle, it seems much more battered, has larger sights and lacks the muzzle brake. 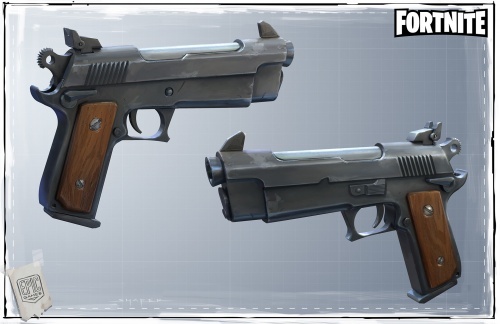 A pair of FN FNX-9 pistols appear in Battle Royale as the "Dual Pistols", available in Epic and Legendary versions. They use Medium Bullets and dish out a fair amount of damage with a reasonable reload speed and fire rate. The Dual Pistols in Fortnite. 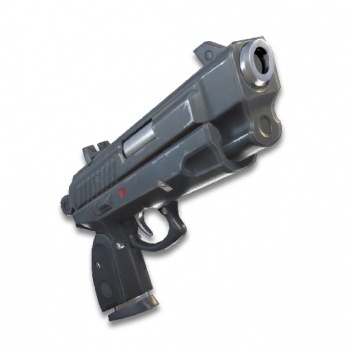 An FN FNX-45 Tactical pistol fitted with a suppressor and red dot sight appears in Battle Royale as the "Suppressed Pistol", available in Epic and Legendary versions. It uses Light Bullets and has a decent reload speed and fire rate, although its damage at even the highest tier is not much stronger than even the rare-tier pistol. A loading screen for Battle Royale shows concepts art of the Suppressed Pistol. 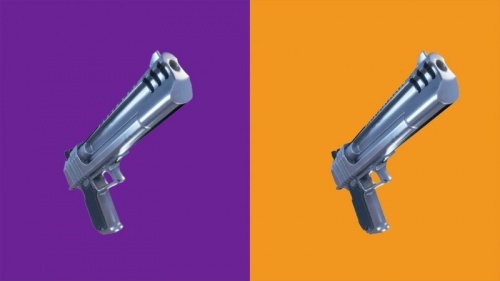 The "Handcannon Pistols" (not to be confused with the Hand Cannon in BR or the Semi-Auto Handcannon in StW which are both Desert Eagles) in Save the World are based on the Taurus Raging Bull. They appear in Rare, Epic and Legendary versions and use Heavy Bullets. The Hand Cannon model from the Save the World mode. The FN P90 originally appeared as the "Bobcat" and was avaliable in the store on Save The World for a week, during the Blockbuster Event. 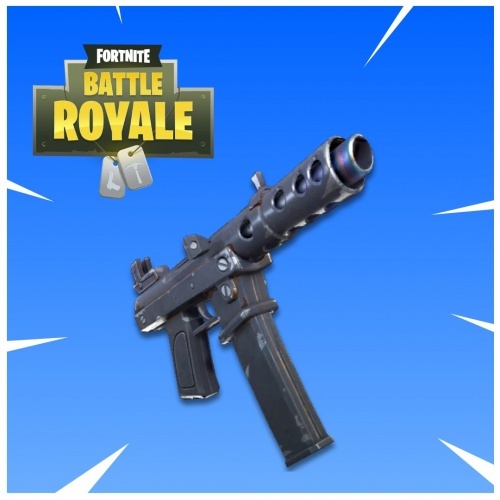 It arrived as the "Compact SMG" in Battle Royale mode after the v5.10 patch in late July 2018. In STW, it excells in mobile engagements against most husks while having a high rate of fire and a 50 round magazine. 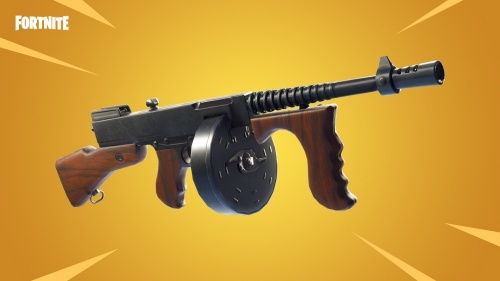 After it was added to BR, it sparked a gigantic controversy because of the fact it dished out an absurd amount of damage, to the point where it outdamaged even the legendary Assault Rifle by almost 60%. After 16 hours, the gun was nerfed to a more acceptable state, and it is still good, but not to the point where it was blatantly overpowered. The Compact SMG. Note how the gun extends forward past the trigger housing rather than back and behind it. The M1928 Thompson submachine gun appears as the "Drum Gun", and is an Uncommon to Rare weapon. As the name implies, it obviously feeds from a drum magazine which holds 50 rounds and is the only submachine gun that uses Medium Bullets. It is a good weapon for close to mid-range combat, as it has some of the best stats of the SMG class. The Drum Gun from Fortnite. It arguably bears the closest resemblance of all the guns in Fortnite to their real-world counterparts. 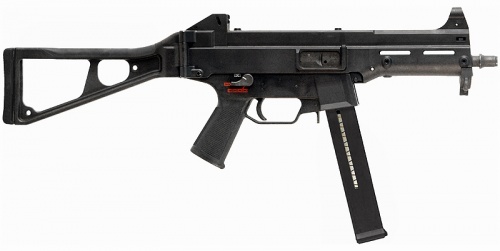 The Heckler & Koch MP5A4 with a UMP-styled stock appears in Battle Royale as the "Submachine Gun" as part of the 5.0 Content Update, replacing the TEC-9 from previous versions. It is available in Common, Uncommon and Rare versions and uses Light Bullets. A different-looking MP5A4 with SD handguard and wood furniture seems to be the basis for the in-game model of the "Burst Assault Rifle" in its lower three tiers for Save the World mode. An MP5A4. Note the smaller selector switch, a telltale difference between the A4 and the A3. 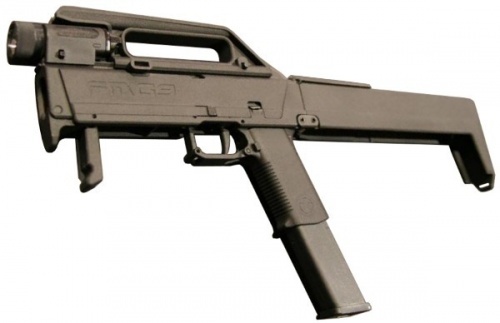 The UMP, shown for comparison of the stock. The Fortnite SMG. Note the A4-style selector switch. 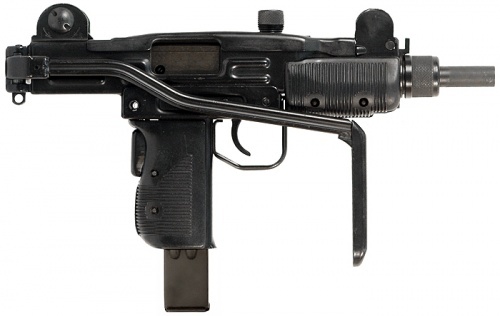 The Heckler & Koch MP5SD6 appears in Battle Royale as the "Suppressed Submachine Gun". It is available in Common, Uncommon and Rare versions and uses Light Bullets. It actually does higher damage than the normal SMG, but at a speed of around half that of the normal SMG. Heckler & Koch MP5SD6 Like the Heckler & Koch MP5A4, it carries the smaller selector switch, setting it apart from older MP5 models. The Supressed SMG in Fortnite. 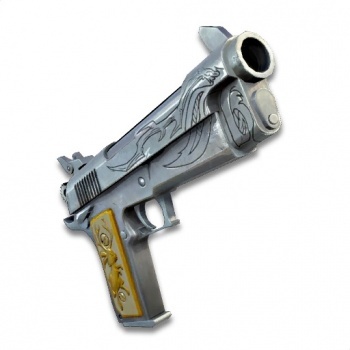 A Mini Uzi appears in Save The World as the "Auto Pistol", with no stock and flaming motif painted on the front of the gun. The weapon model is the same throughout all rarity tiers, and uses Light Bullets. It's damage and rate of fire improves as the tiers increase, but even its base form is one of the best SMG's in Save the World. Shotguns in Fortnite use "Shells 'n' Slugs" as ammo; while the latter is actually a type of the former, it's understandable if the former refers to buckshot shells for the sake of distinguishing the two. 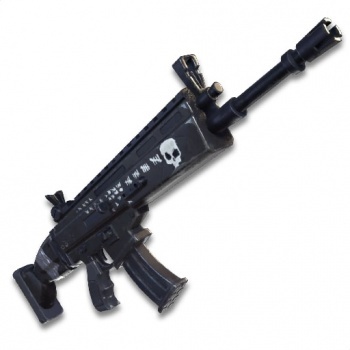 The AA-12 appears in Save the World mode as the "Automatic Shotgun" and its higher-tier variants, Kodiak (rare), Bearcat (epic), and Tigerjaw (legendary). Understandably, it offers a rather high rate of fire with a damage rate that is about in the middle of the shotgun class. A shotgun introduced with the Patch 4.0 in Save The World named "Ground Pounder" seems to be closely based on a Benelli M4. The model has a stock similar to the default folding stock of the M4, a small red dot sight resembling a C-More RTS2 and appears overall poorly serviced: the original handguard is nowhere to be seen, what appears to be a yellow M4A1 rail system crudely attached to it serves as a replacement, and the magazine tube and barrel are held together with steel cables. The weapon has a very high semi auto rate of fire and comes by default with a 7 round magazine tube. The Kel-Tec KSG appears in Save the World as the "Room Sweeper" Legendary Auto Shotgun; as the category name suggests, the in-game gun is fully-automatic, in contrast to the real-life KSG, which is pump-action; to facilitate this, a (curiously downward-bent) reciprocating charging handle and ejection port have been added to the side of the receiver. 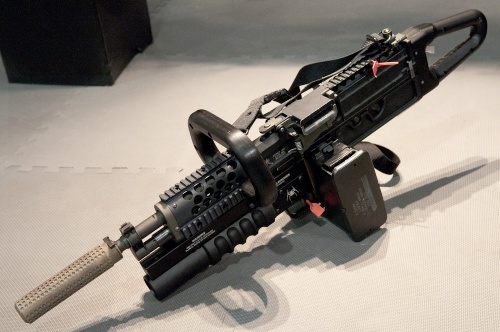 The Room Sweeper is also fed by a detachable drum magazine, another departure from the real-world KSG, which is fed by twin magazine tubes loaded from behind the trigger housing; the in-game weapon still has the tube magazines, despite them no longer serving any real purpose. The Room Sweeper offers some of the highest damage of the entire shotgun class, with an impressive magazine size and fire rate to boot. The "Room Sweeper". Note the the unusable (and backwards) reflex sight, and the somewhat redundant front sight protector, which lacks an actual front sight post (unless the idea is that the two wings are supposed to be a pseudo-aperture to be lined up with the post on the reflex sight, forming a backwards set of ghost-ring backup irons, but that's reaching a bit). 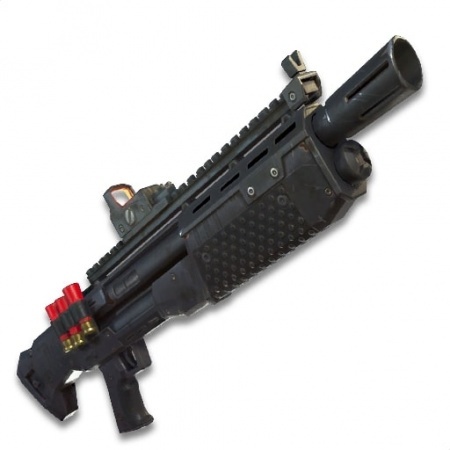 The "Heavy Shotgun" in Battle Royale mode seems to be based on a Standard Manufacturing DP-12; unlike that shotgun, however, the Heavy Shotgun uses a conventional layout (rather than the DP-12's bullpup arrangement), and has only one barrel and one magazine tube, rather than the DP-12's two of each. The latter could explain why it only holds 7 rounds; the real DP-12 has a capacity of 12+2 (when using 3-inch shells) or 14+2 (when using 2.75-inch shells), with each magazine tube holding 6 or 7 shells respectively. 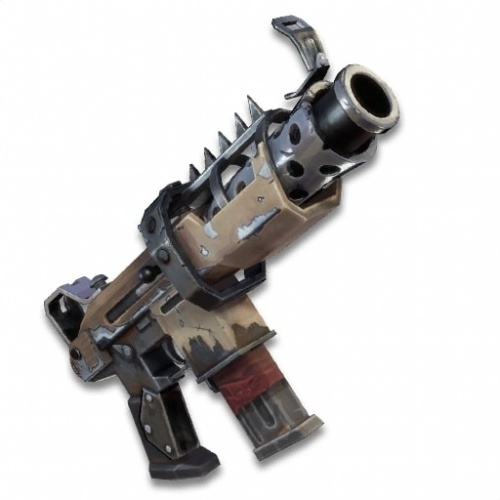 The same weapon also appears in Save the World mode, where it is referred to as the "Backbreaker"; there, it is a Legendary-tier shotgun, with a good rate of fire, good range, and decent knockback, hampered slightly by its below-average damage. The "Heavy Shotgun". Or the "Backbreaker", depending on which mode you're in. Similar to the "Room Sweeper", it has an unusable backwards reflex sight and a front sight protector without an actual front sight post; it also has an unusable spare shell holder, and what appears to be a slotted flash hider. 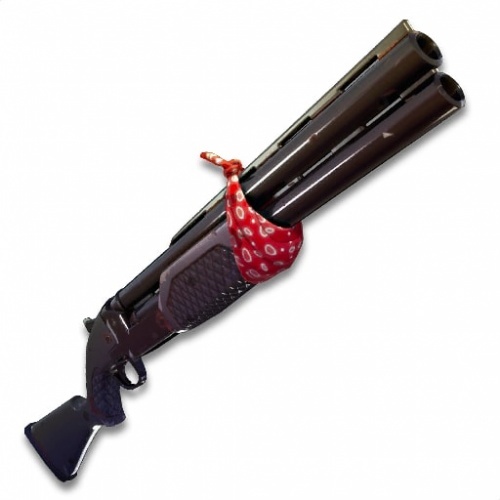 A Sawn-off Double Barreled Shotgun appears in Save the World as the "Double-barreled Shotgun". While understandably having a low rate of fire and a short range, it does offer a medium amount of damage at close quarters. The in-game model is very generalized in its design, and doesn't bear any obvious resemblance to a particular gun. 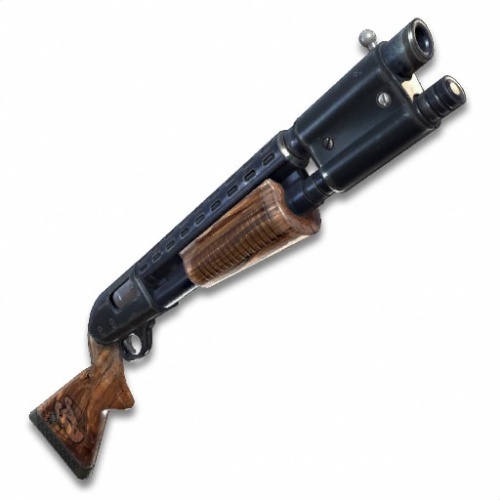 The Mossberg 500 Field Gun appears in Battle Royale as the "Pump Shotgun", as both uncommon and rare tiers. The shell ejector seems to be incorrectly placed between the magazine tube and the barrel. The gun does high damage at a slow rate of fire. 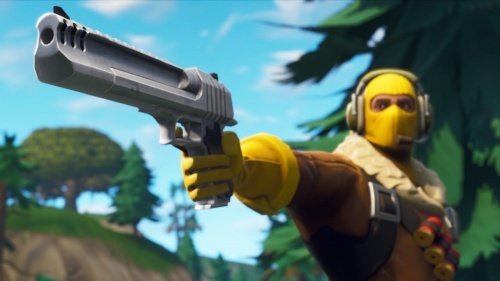 Earlier in the game, it was able to one-shot an enemy with full shields and health up until a patch that nerfed it's ability due to overusage, and the use of the "double pump" exploit, that allowed players to switch between two shotguns without having to pump either of them. Up to until Patch 5.0, it was somewhat infamous due to random spread sometimes making well aimed shots do pitiful poke damage. The gun spread was later made fixed with Patch 5.0 across all shotguns. 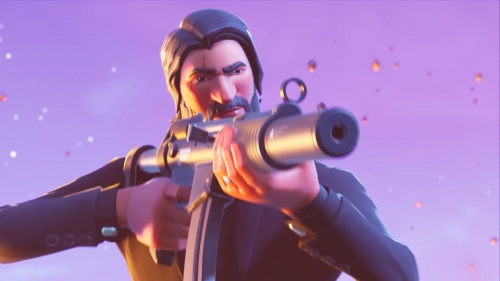 In Save the World, the Field Gun model is also used for the "Pump-Action Shotgun" series, particularly the eponymous and "Knight" variants. The model for the Pump Shotgun in Fortnite. 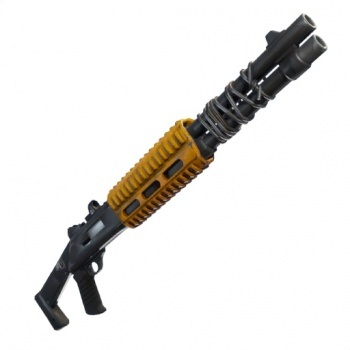 The Mossberg 500 Homeland Defender appears to be the basis for several different Fortnite shotguns. 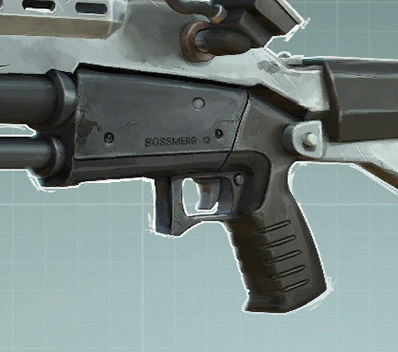 The weapon model used for the "Precision Tactical Shotgun" series in Save the World appears to be a rusty-looking Mossberg 500 Homeland Defender with a folding stock, while the same model is used for the "Tactical Shotgun" in Save the World, but with the stock removed (making it look closer to the Mossberg 500 Cruiser. The STW variants all use 6 round magazine tubes, while the BR version amusely uses a 8 round magazine that is clearly way too small to hold that many shells. The in-game model of the Heavy Shotguns (STW) and the Tactical Shotguns (BR) also seem to bear some resemblance to the Homeland defender underneath all the extra decor and furniture covering the outside, which was apparently added as a way to convert the weapon to semi-automatic (by having the recoil throw the pump backwards), creating an weird hybrid of pump and semi auto action. It also features a left mounted sonar, which amusingly displays a game of Snake. 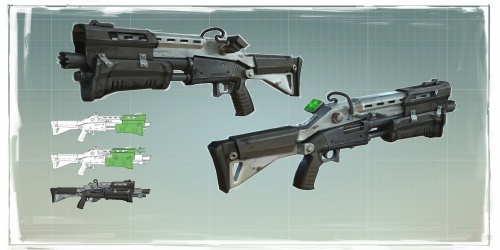 A loading screen showing detailed concept art of the tactical shotgun. A closeup of the concept art. Notice the name "Bossmerg" on the gun's left profile, an obvious nod to the real-world manufacturers. All three variants of the Tactical Shotgun from STW. The Tactical Shotgun model from Battle Royale. 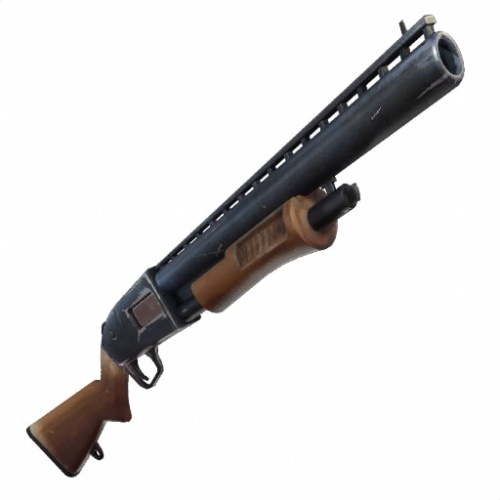 The Mossberg 590 appears in Save the World as the "Crusader" and "Templar" version of the "Pump-Action Shotgun". The Legendary variant of the "Pump-Action Shotgun" in Save The World, "The Bear", appears to be a hybrid of two of the Remington 870's military configurations - combining the simple bead sight arrangement, heat shield, and recoil pad of the "Trench Gun" with the distinctive barrel clamp and extended magazine tube of the USMC setup (despite holding, like the rest of the Pump-Action Shotgun variants, a measly 5 shells (unless certain perks are equipped)); just to confuse matters further, it also has the blued finish and serrated pump handle of some of the 870's commercial variants. The in-game model of The Bear. The Over/Under shotgun in Save the World seems to be based on a Baikal MP-27. The model seems well worn, and features a black bandanna wrapped around the end of the handguard that goes around the barrels. The shotgun isn't specialized in direct damage; rather, it features a large spread with a huge amount of pellets, and is primarly made for crowd control, hitting multiple husks at once with it's massive spread, and having also huge knockdown power, staggering normal, Husky husks, and even bosses alike. Comes in Common, Uncommon and Rare variants. The Blaser F3 over/under shotgun appears as the Epic and Legendary variants of the Over/Under shotgun, named "Bandit" and "Maverick", originally represented by the Baikal. Like their lower end counterparts, it is a multi target, crowd control shotgun that has somewhat frequent rolls for critical hits, fires fast, and has a huge amount of knockback, being able to knock down multiple Husks and even bosses at close range. Like the Baikal, it has a bandanna wrapping around the end of handguard and barrels, this time colored red. The model for the Maverick/Bandit in STW. The Colt M16A1/653 Carbine appears in Fortnite as the "Assault Rifle" in both Save the World and Battle Royale. It is the most basic of the rifles, offering mediocre damage and rate of fire. The model features a 3rd gen collapsible stock, slickside upper receiver, A1 grip, and a weird mesh of half to full fence lower receiver that is somewhat useless due to the fact the gun doesn't feature a magazine release button. 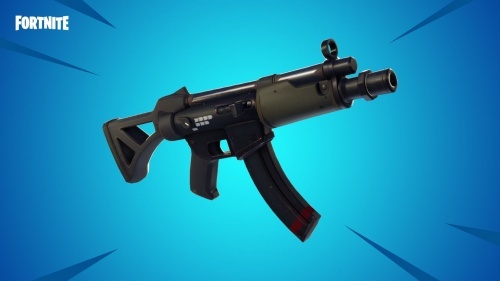 The assault rifle can be found in common, uncommon, and rare tiers, and uses Medium Bullets in BR mode, while it uses light ammo in STW mode. Amusingly, the front sight is backwards, much like the Colt Model 733 featured in the 3D Era Grand Theft Auto games. The "Thermal Scoped Rifle" can sometimes be found in Battle Royale mode. As it's name implies, it is fitted with a thermal scope that makes enemies easier to spot. Of the rifles in the game, the Thermal Scoped Rifle is perhaps the most simplistic and ambiguous in design, as it bears slight resemblance to a multitude of well-known assault rifles. According to the Fortnite Wiki though, the gun is loosely based on the M4/M4A1 SOPMOD, although the charging handle is on the side of the gun, not the back (as is characteristic of the AR-15/M16.). It features an ACOG scope, a flashlight, vertical foregrip, a magazine attachment resembling a Magpul Assist, and an AN/PEQ 15 laser sight. The Thermal Scoped Rifle has a relatively low fire rate, but it does dish out a high amount of damage in return. It uses Medium Bullets. 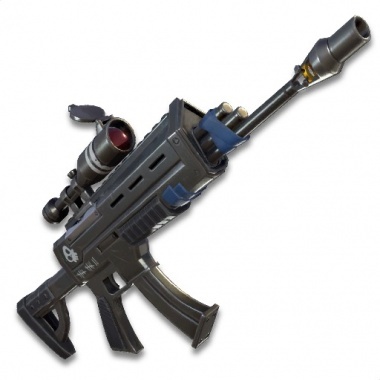 In Save the World, the weapon is known as the "Tiger", and features a much higer fire rate and less recoil. The Tiger/Thermal Scoped Assault Rifle. The model used for the "Scoped Assault Rifle" seems to be an hybrid of a CZ 805 BREN and a Beretta ARX-160. 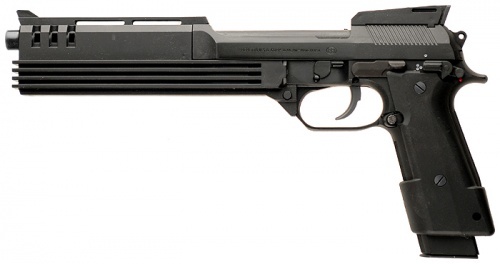 The Beretta influence can be seen on the lower receiver and handguard, while it features the receiver ports and gas piston of the BREN. It also features a large Leupold scope and a diamond-shaped muzzle brake to handle the recoil. The same model appears in Save the World mode as the Surgical Rifles, named Nightlance and Deathstalker. The gun has a rather low damage output and rate of fire, but it does have the advantage of range. In STW, the weapon fires in 3-round bursts but features a smaller, 15 round magazine. It uses Medium Bullets on STW, which may hint it is a .300 Blackout conversion. The FAMAS appears in Fortnite as the Epic and Legendary tiers of the "Burst Assault Rifle" in Battle Royale mode. The FN SCAR-L appears in STW mode as named variants and in BR mode as the higher-tiered "Assault Rifle". In both game modes, the rifle offers significantly higher stats than the lower-tier assault rifles, although it still takes the same ammo type. It can appear as an epic or legendary. In STW, an special version called the "Nocturno" with a black color scheme and skull and tally marks is avaliable for players that purchased the Ultimate Founder's Pack. The Nocturno, an special version avaliable to Ultimate Founders. 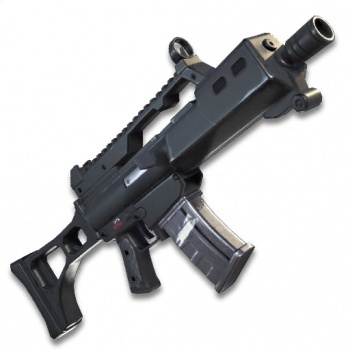 The Heckler & Koch G36C appears in Fortnite as the Epic and Legendary tiers of the "Burst Assault Rifle" in Save the World mode. Like the other burst rifles, it has names based on razors. The lower three tiers of the "Burst Assault Rifle" in Battle Royale mode appear to be loosely modeled after the Carl Gustav M/45, feeding from Sturmgewehr 44-like magazines. The "Semi-Auto Rifle" in Save the World mode uses the same model. 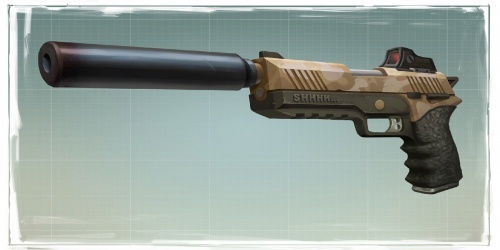 The Springfield Armory SOCOM 16 CQB appears in Save The World as the Epic and Legendary tiers of the "Semi-Auto Rifle", respectively named "Raptor" and "Hunter-killer". The "Bolt-Action Sniper Rifle" in Battle Royale is modeled after the Accuracy International Arctic Warfare series of sniper rifles, though in-game it holds only one round despite being depicted with a box magazine; bizarrely, despite being explicitly referred to as a bolt-action, the in-game rifle has a straight-traveling charging handle that reciprocates and ejects a spent casing when the weapon is fired, making the "Bolt-Action Sniper Rifle" the world's first semi-automatic rifle with a one-round capacity. The model is reused for the "Standard Scoped Sniper" in Save the World, and an unscoped version of the AW is the weapon model for the Epic and Legendary variants of the "Standard Sniper". A Barrett M107 was added to the game during the Blockbuster event as the "Obliterator". The weapon has heavy recoil and a (innacurate) 4 round magazine, alongside a special property that allows it to go through multiple walls, enemies and large shielders' shields alike, and deals massive damage to non-friendly structures, alongside having massive damage potential against larger enemies. The weapon was added to Battle Royale on Patch 5.21 as the "Heavy Sniper Rifle". While it does not have the wall penetrating property, it still does massive damage to structures (being able to destroy any building piece, player built or not, in one shot) and has less bullet drop than the other sniper rifles. A rifle resembling the E2 machine gun variant of the M14 rifle is used as a weapon model by multiple in-game weapons, such as the "Hunting Rifle" in Battle Royale and "Bolt-Action Sniper" in Save The World. A model with a scope is also used as the "Scoped Bolt-Action Sniper" in the latter. As the name implies, the gun is bolt-action, unlike the real-world M14, which operates in semi and full automatic. In Fortnite, the rifle can put out a decent amount of damage in a pinch, but its range and rate of fire can put players at a bit of a disadvantage. As with all the sniper rifles, it used heavy ammo. An unscoped SVD Dragunov is the weapon model for the Common, Uncommon and Rare variants of the "Standard Sniper" in Save The World. 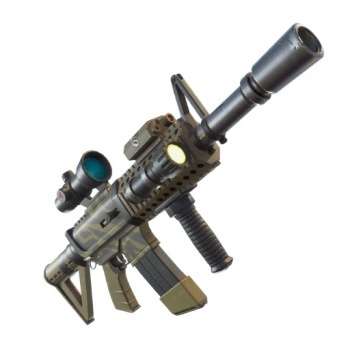 The same model is used in-game for Save the World's "Automatic Sniper Rifle" and Battle Royale's "Semi-Auto Sniper RIfle". As is to be expected, the guns have a higher ammo count and rate of fire than their counterparts, but at the sacrifice of damage. The in-game model resembles a mix between a Galil Sniper Rifle and the Ruger Mini-14 GB-F. The "Minigun" in Fortnite is quite peculiar in its design. 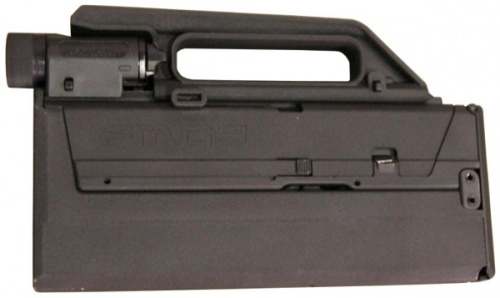 As the concept art in a loading screen would suggest, the gun can be collapsed into a small box and carried in a compacted state, much like the Magpul FMG-9. When deployed, it resembles a Knight's Armament LMG ChainSAW, but also has obvious characteristics of a Hand Held M134 Minigun The artwork also suggests that the gun has an interchangeable single barrel, but such an attachment is not seen in gameplay. The coloration of the gun and some of its cosmetics are also reminiscent of the M41A Pulse Rifle from the Aliens films. M41A Pulse Rifle from Aliens. 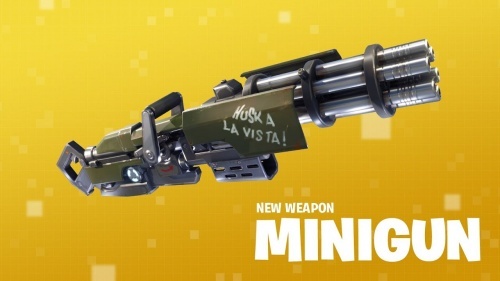 Its coloration and outer plating is reflected in Fortnite's minigun, as well as a vented piece on the underside of the minigun, reminiscent of the Pulse Rifle's undebarrel grenade launcher. The "Light Machine Gun" in Battle Royale is inspired by the M249 light machine gun, although it bears elements from its lighter variant, the Mk 46 Mod 0. It deals damage significantly higher than many of the guns (save shotguns and snipers), and its rate of fire is significantly higher than any of the assault rifles. Strangely enough, the Rare variant beats the Legendary Scar in DPS by 2 points (200 DPS to 198 DPS), but loses in damage per bullet by 11 points. The weapon was later added to Save the World as the "HackSAW", an alternative to the game's older Light Machine Gun using light bullets. The HackSAW/Light Machine Gun model. 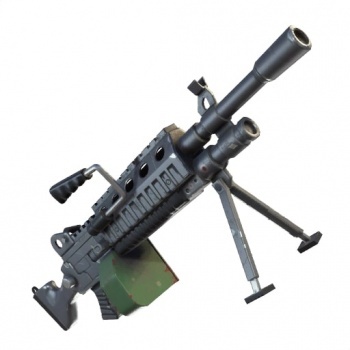 The M60 is the main weapon model used for the Light Machine Gun in Save The World, despite being a general-purpose machine gun in real life. Like the Minimi, it also uses Medium Bullets (which would make sense if the Minimi is a 7.62 variant) and boasts a similarly high damage output. The Guided Missile Launcher in Battle Royale is partialy based off an AT4 anti-tank launcher. The weapon features a grip reminescent of the ones used in the Carl Gustav recoilless rifle, and can be reloaded unlike it's real life counterpart. The weapon fires guided missiles that are controlled by an arcade-esque joystick. The weapon was removed from the game and put in the Vault on April after a lot of complaints from people frustrated at how it made the game slow, and following a bug that affected the weapon. In a 5.1 patch content update, the launcher was brought back to the game, and is much rarer, and has lower damage and turning radius, making it more of an scouting tool than a lethal weapon. The Guided Missile launcher: note the protuding missile and the Carl-Gustav esque grips. As a Raptor and a Havoc witness the carnage caused by the missile on the weapon's trailer, the controller for the missile itself can be seen. 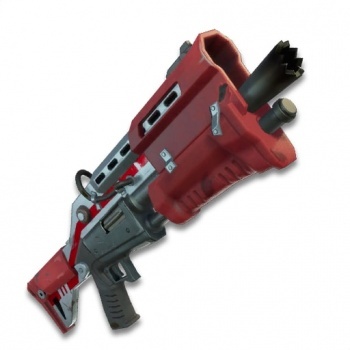 The M202 FLASH is avaliable exclusively in Save the World as the "Quad Launcher". It was avaliable during the Blockbuster event in the store. It uses a light green color scheme and appears well worn. Hilariously, it is reloaded through a port on the side, instead of reloading the rockets on the back, which seem to not actually be rockets, instead being simple exhausts. It fires incendiary rockets that deal no impact damage, and instead leave a huge pool of burning napalm that sets enemies on fire and deals huge damage over time. 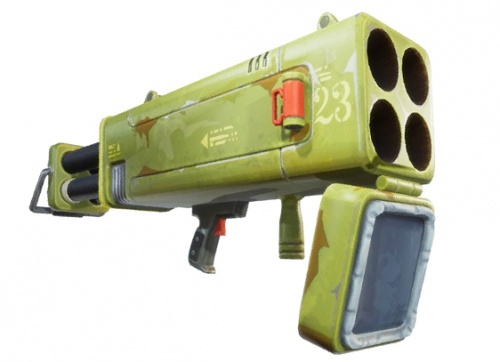 The M32 MGL appears in both Save the World and Battle Royale, simply called "Grenade Launcher". The Epic and Legendary variants in the former are called "Blooper" and "Thumper", both of which were nicknames for the M79 grenade launcher used during the Vietnam War. 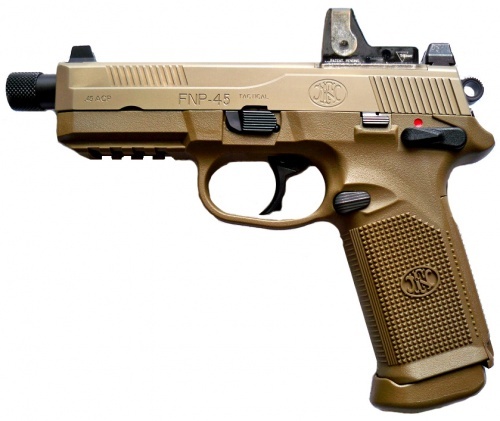 The model uses a tan finish and lacks picatinny rails, being fitted with a vertical grip. It reloads using large speedloaders. Like other explosives on STW, it has infinite ammo but consumes durability very quickly. 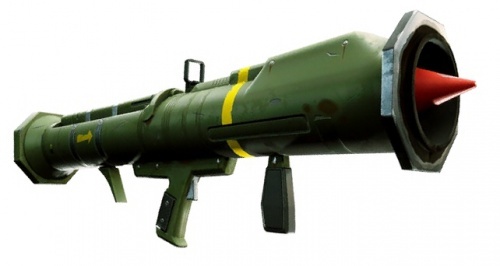 In Battle Royale, it uses the same rocket ammo avaliable for the Rocket Launcher and Guided Missile. The Grenade Launcher as it appears in Fortnite. The RPG-7 appears in both Save the World and Battle Royale, simply called "Rocket Launcher". 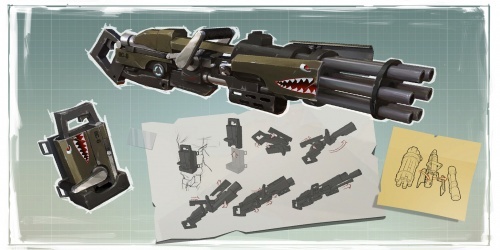 The model has cartoonish proportions and reversed grips like the Soldier's RPG-7 in Team Fortress 2, however unlike that model, it shows the rocket at the muzzle, which is depicted with the same "Flying Tiger" decal as the Minigun. 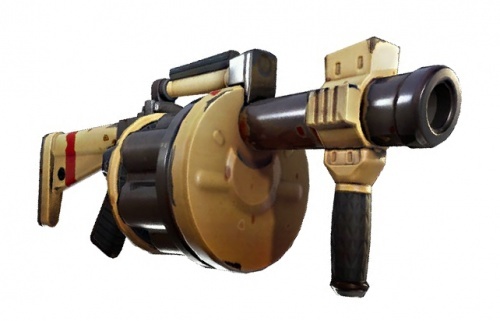 In STW, the Legendary variant is nicknamed the "Bazooka", which while used as a general term to label rocket launchers in video games, is actually a completely different set of rocket launchers in real life. 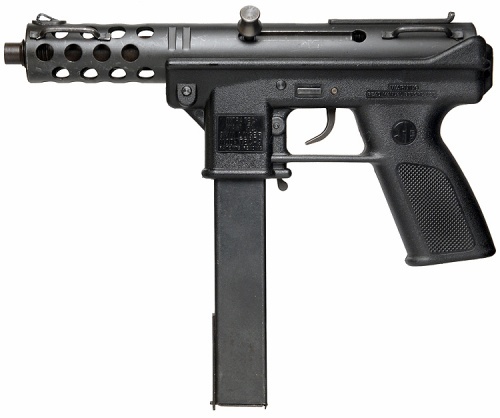 The TEC-9 appeared in Battle Royale as the "Submachine Gun" and the "Tactical Submachine Gun" prior to being replaced by the MP5 in a July 2018 patch. It offered slightly lower damage than the new SMG, but it did carry more ammo per magazine. It was available (in one form or another) in every tier except for Legendary. 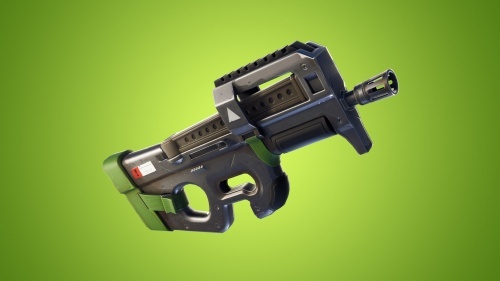 The Tactical SMG has since been placed into a vault and is unusable in Battle Royale. In Save The World, it appears as the weapon model for the "Slasher", "Ripper" and "Threader" versions of the "Heavy Auto Pistol". The in-game model for the "Tactical SMG" from Battle Royale and the named versions in Save the World. The exterior decor makes it resemble something out of the Mad Max or Fallout universes, but one can clearly see a TEC-9 style gun underneath all the furniture.